Who says low-point beer can't be delicious? W hen I heard High West Distillery was getting into the beer game, I thought, "Why the hell not?" Brewers have been enjoying their whiskeys for a good decade or so, imparting their special bourbon and rye blends into ales all over the West. High West should at least give it try themselves. Well, I guess they did. Looking to their brothers and sisters at Ballast Point Brewing, the two Constellation Brands-owned entities decided upon a different approach to their first beer. They found it in an obscure style of lager from the days before Prohibition, calling it Western Standard and billing it as a "sessionable, barrel-aged lager." Western Standard Saloon Lager: This 5.2-percent beer pours a dark copper hue, with a head that starts strong but fizzles to a thin cap that dissipates quickly. The lager itself has many of the qualities you'd expect from the pre-Prohibition style, full of adjunct aromas like corn and syrup, but also with sweet notes of wet cedar. Upon first sip, it's a different story. The High West barrel part of the beer punches right at your palate like Alec Baldwin at a paparazzo. It starts with creamy vanilla and campfire marshmallows; the rye whiskey component comes in next, reining in the sweetness. Oak takes over at mid-point and hangs on like Indiana Jones behind a Nazi troop transport. The nice drying quality from the wood keeps the beer from becoming overly sweet and cloying. The mouthfeel is light, but I hate to call it thin. If you're going to compare it to other barrel-aged ales, I can understand the temptation; however this beer fits perfectly within the style that was intended. Overall: Western Standard's strengths are its complexity and drinkability. It has far more character than any of its kin in the market, and it manages to deliver a pleasant bourbon sweetness that's not full of dry tannin flavors. If you're into crushability with extra dimensions, give this a try. Western Standard will only be available in stores in Minneapolis, Phoenix, Salt Lake City and Park City. 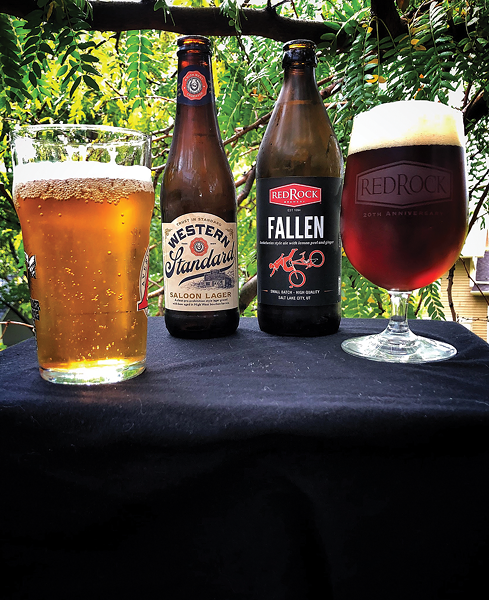 Red Rock Fallen: This beer looks to be the first of many new ones coming from Red Rock Brewing's new head brewmaster Kevin Davis. This beer takes its cues from central Bavaria, but from there, it's all Salt Lake City. Poured from one of Red Rock's German-sourced 500-milliliter bottles, this 4-percent beer produces an amber-tinged brown liquid with a good three-fingers of thick, tan-colored head. Aromatic notes of bananas, pear, clove and a touch of Juicy-Fruit are noticeable up front. After resting a bit, distinct sweet apple notes emerge, with toasted bread and ginger peppering up mid-palate sensations. Lemon and some grassy bitterness carry you into the end, where you're met with a surprisingly atypical amount of fruity notes. The beer is fairly dry, especially for a dunkle, but doesn't come off as thin. Lightly tart as wheat beers often are, this quality accentuates the added lemon peel, which makes for a nice long finish. As the beer warms a bit, a touch of dusty cocoa flavor starts to come out, but only just a hint. Overall: This is a tasty dunkelweizen; although not a prototypical example. I like the balance it strikes between fruit and phenolics, however, definitely making it an enjoyable brew, with a tartness that makes it quite easy drinking. The Western Standard Saloon Lager should be in DABC stores any time now, with Red Rock's Fallen Dunkel hitting Harmons grocery stores tout-suite as well. As always, cheers!